Scar wars: is TGFβ the phantom menace in scleroderma? The autoimmune disease scleroderma (systemic sclerosis (SSc)) is characterized by extensive tissue fibrosis, causing significant morbidity. There is no therapy for the fibrosis observed in SSc; indeed, the underlying cause of the scarring observed in this disease is unknown. Transforming growth factor-β (TGFβ) has long been hypothesized to be a major contributor to pathological fibrotic diseases, including SSc. Recently, the signaling pathways through which TGFβ activates a fibrotic program have been elucidated and, as a consequence, several possible points for anti-fibrotic drug intervention in SSc have emerged. During normal connective tissue repair, fibroblasts proliferate and migrate into the wound, where they synthesize, adhere to and contract extracellular matrix (ECM) proteins, resulting in wound closure. It has been proposed that a failure to down-regulate the normal tissue repair program causes the pathological scarring characterizing fibrotic diseases [1, 2]. Fibrotic disease can affect individual organs, such as the kidney, liver, pancreas or lung, or be systemic, affecting all organs [1–5]. In its most severe forms, fibrosis results in organ failure and death. The systemic autoimmune disease scleroderma (systemic sclerosis (SSc)) possesses a significant fibrotic component; indeed, pulmonary fibrosis is the cause of the high mortality observed in SSc . Identifying targets around which to base selective, anti-fibrotic therapies is, therefore, essential. The fundamental mechanism underlying the excessive scarring observed in SSc is unknown. However, fibrosis is generally considered to arise from a failure to down-regulate the normal tissue repair program . One of the major cytokines induced during the tissue repair is transforming growth factor (TGF)-β . As TGFβ induces fibroblasts to synthesize and contract ECM, this cytokine has long been believed to be a central mediator in wound healing and fibrotic responses, including SSc ; however, the exact contribution of TGFβ to the fibrotic phenotype of SSc is unclear. Furthermore, as TGFβ plays many roles in normal physiology, including as a suppressor of the immune response and epithelial proliferation, broadly targeting TGFβ signaling for the treatment of disease is anticipated to be problematic . Thus, much interest exists, from both clinical and pharmaceutical points of view, in identifying methods of intervening within the TGFβ signaling cascade in such a fashion that the pro-fibrotic aspects of TGFβ signaling are blocked but other TGFβ-dependent processes are unaltered. This review critically evaluates the evidence supporting the notion that TGFβ is a critical mediator of fibrogenesis in SSc, and assesses whether there are intervention points within the TGFβ cascade that might be appropriate targets around which to base selective anti-fibrotic therapies to treat SSc. There are three TGFβ isoforms, TGFβ1, TGFβ2 and TGFβ3, which are synthesized as latent precursors in complex with latent TGFβ-binding proteins (for reviews, see [8–11]). When these binding proteins are removed by proteolysis, TGFβ is activated. The 'TGFβ activators' include the proteases plasmin, matrix metalloproteinase (MMP)-2 and MMP-9, thrombospondin-1, and the integrin binds αvβ6. Active TGFβ to a heteromeric receptor complex, consisting of one TGFβ type I and one TGFβ type II receptor. In the presence of TGFβ ligand, the TGFβ receptor I kinase phosphorylates the receptor-activated Smads (R-Smads), Smad2 and Smad3, which are then able to bind the common mediator Smad, Smad4, and translocate into the nucleus (Figure 1). The Smad3-Smad4 pair binds promoters at the Smad consensus sequence, CAGAC . Smad2, on the other hand, is not believed to bind DNA directly, but rather requires a nuclear DNA-binding protein of the family Fast (Fast-1) to bind DNA . The ability of this complex to activate transcription depends on the ability of Smads to recruit common transcriptional cofactors, such as p300, and basal transcription factors, which vary depending on the promoter of interest. A third group of Smad proteins, the inhibitory Smads Smad6 or Smad7, prevents R-Smad phosphorylation and subsequent nuclear translocation of R-Smad-Smad4 heterocomplexes; it appears that Smad7 competes with Smad2 and Smad3 for binding to the TGFβ type I receptor . 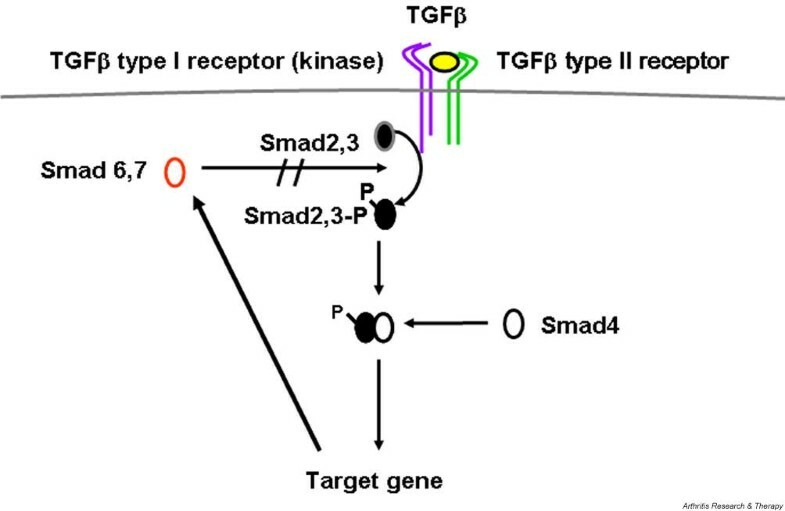 TGFβ also induces Smad7 through a Smad3 and Smad4-dependent mechanism, suggesting that TGFβ can suppress its own action via the induction of Smad7  (Figure 1). Overall, the Smads mediate immediate-early responses to TGFβ, and their activity is tightly controlled. Transforming growth factor (TGF)β signaling generally occurs through TGFβ type I and type II receptors and Smads. TGFβ binds to the TGFβ type I and type II receptors. The type I receptor contains kinase activity, and phosphorylates receptor-activated Smads, Smad2 and Smad3, which dimerize with Smad4. The resultant complex migrates into the nucleus to activate target gene expression. TGFβ induces the inhibitory Smads, Smad6 and Smad7, which block TGFβ receptor type I-dependent Smad 2/3 activation. In addition to the Smads, TGFβ also causes the activation of other signaling pathways, for example the mitogen activated protein kinase cascades. These cascades are not required for Smad activity per se, but are required for the activation of basal transcription factors and potentially for the enhancement of TGFβ responses [10, 16–18] (Figure 2). Thus, transcriptional responses to TGFβ generally require the type I and type II TGFβ receptors and the Smads (Figure 2). Specificity of transcriptional responses to TGFβ rely, therefore, on ancillary signaling pathways induced by TGFβ, and the basal transcription factors recruited to the promoter (Figure 2). Schematic diagram of general and gene-specific transforming growth factor (TGF)β signaling in fibroblasts. TGFβ binds to the TGFβ type I and type II receptors, activates Smad3, which activates target gene expression by binding the sequence CAGA. This pathway regulates virtually every TGFβ responsive gene in fibroblasts. Conversely, TGFβ can act with endothelin-1 (ET-1), connective tissue growth factor (CTGF) and extra domain A-fibronectin (EDA-FN) via the endothelin receptor A and B (ETA/B) receptors, syndecan 4 and integrins to activate ERK and focal adhesion kinase (FAK), which are required for target gene expression, in a promoter-specific fashion (for details see text). Evidence supporting the contribution of TGFβ in fibrotic responses has principally been derived using acute in vitro or in vivo models. For example, treatment of fetal wounds with TGFβ promotes wound closure and scarring [19, 20]. In addition, injection of TGFβ, either directly subcutaneously or into metal chambers, results in enhanced deposition of ECM [20–22]. Furthermore, incisional rat wounds treated with anti-TGFβ antibodies or antisense oligonucleotides show a marked reduction in ECM synthesis and scarring [23, 24]. Although TGFβ1 deficient mice display markedly reduced collagen deposition compared to control mice, such mice also show a severe wasting syndrome accompanied by a pronounced, generalized inflammatory response and tissue necrosis, resulting in organ failure and death [25, 26]. These results are consistent with the fact that, as discussed above, TGFβ is pleiotropic and that broad targeting of TGFβ in humans is likely to have adverse side-effects. . Indeed, resistance to the antiproliferative effects of TGFβ is a hallmark of cancer cells . Addition of TGFβ ligand to cells or mice causes only a transient fibrotic response, which persists only as long as TGFβ ligand is present [22, 28]. TGFβ does promote persistent fibrotic responses in vivo, but requires a cofactor, such as connective tissue growth factor (CTGF, CCN2) . This notion that other factors are required to perpetuate fibrotic responses to TGFβ is supported by observations using materials derived from SSc patients. In dermal fibrotic lesions of scleroderma patients, elevated TGFβ levels exist at the leading edge of the forming scar tissue, but not within the established lesions . In addition, elevated serum TGFβ levels are found only in some patients . Finally, a recent report showed, paradoxically, that TGFβ levels in patients with diffuse SSc showed lower levels of active TGFβ in serum, relative to controls, and, moreover, active TGFβ levels correlated inversely with the severity of fibrosis . These results may suggest, however, that TGFβ might be preferentially sequestered, and consumed, by the connective tissue in SSc . The overexpression of type I collagen by cultured SSc fibroblasts, which produce neither elevated TGFβ levels nor increased latent TGFβ, is nevertheless reduced by neutralizing TGFβ antibodies or antisense RNA . These results suggest that SSc fibroblasts show an enhanced response to endogenous TGFβ ligand. It is interesting to note, however, that an oral presentation at the 2004 International Scleroderma Meeting at Cambridge, UK, discussed a clinical safety trial using a neutralizing anti-TGFβ antibody in SSc patients. This trial showed that a neutralizing anti-TGFβ antibody showed neither an anti-fibrotic ability nor a toxic side-effect. However, as only one dose of antibody was used, it is difficult to evaluate from this unpublished study whether targeting TGFβ ligand may be an appropriate anti-fibrotic strategy in SSc. A priori, the enhanced response to TGFβ in SSc fibroblasts may arise through an elevation in TGFβ receptor levels. Indeed, SSc fibroblasts possess increased levels of the signaling TGFβ type I receptor, relative to the TGFβ type II receptor . As overexpression of TGFβ type I receptor in normal fibroblasts increased basal collagen expression in a dose-dependent manner, it is conceivable that the over-expression of type I collagen observed in SSc fibroblasts may arise because of this defect . Supporting the idea that TGFβ signaling through the TGFβ type I receptor contributes to the pathogenesis of SSc, the over-expression of type I collagen by SSc fibroblasts is blocked by a TGFβ type I receptor antagonist . Similarly, the enhanced ECM contraction and adhesion observed in SSc fibroblasts depends on TGFβ type I receptor activity [34, 35]. However, it should be pointed out that TGFβ type I receptor inhibition also reduced basal collagen synthesis, adhesion and contraction in normal and SSc fibroblasts, consistent with the notion that the contribution of TGFβ and TGFβ signaling to the phenotype of SSc fibroblasts may arise from an exaggeration of processes operating in normal fibroblasts [34, 35]. Further complicating the issue, TGFβ type I receptor inhibition had no significant effect on the overexpression of CTGF or α-smooth muscle actin by SSc fibroblasts . Collectively, these results suggest that signaling through the TGFβ receptors is likely to contribute to some aspects of SSc but not others. Finally, as discussed above, although these data strongly suggest that the TGFβ ligand-type I receptor axis contributes to the fibrotic phenotype in SSc, broad targeting of the type I TGFβ receptors is likely to be problematic in SSc as the type I receptor generally mediates TGFβ signaling . Indeed, animals genetically deficient in TGFβ receptor type I die in utero and display severe vascular defects . That said, the above data suggest that identifying a method of reducing the type I/type II receptor ratio to that of normal fibroblasts might be a viable method for selective anti-fibrotic drug intervention in SSc. In addition to implicating TGFβ ligand, acute in vitro and in vivo models have strongly supported the role of Smad3 in fibrogenesis. Following incisional wounding, animals lacking Smad3 show accelerated wound healing, reduced granulation tissue formation, increased epithelialization, and reduced inflammation, possibly due to an impaired chemotactic response . Smad 3-deficient mice display resistance to cutaneous fibrosis caused by radiation injury  or bleomycin . Experiments using microarrays and western blot analyses have compared gene expression profiles of fibroblasts taken from adult Smad3-/- and Smad3+/+ mice, and have shown that TGFβ was not able to induce transcription in Smad3-/- fibroblasts, including the production of matrix and proadhesive proteins such as collagen and CTGF [40–42]. However, between four and six months of age, Smad3 mutant mice become moribund, with chronic inflammation and colorectal adenocarcinomas . Smad 3 deficient mice also can develop degenerative joint disease resembling human osteoarthritis, as characterized by progressive loss of articular cartilage, decreased production of proteoglycans, and abnormally increased number of type X collagen-expressing chondrocytes in synovial joints . These results strongly suggest that targeting Smad3 pharmacologically would be expected to have severe side-effects. Within the context of SSc, leading edge SSc fibroblasts show activation of Smad3; in some studies, this activation has been shown to depend on TGFβ ligand, whereas other studies have shown this may be ligand independent [45, 46]. Although both type I collagen and CTGF are induced by TGFβ in a Smad-dependent fashion, the elevated activity of the type I collagen promoter in SSc cells is dependent on the Smad element; however, the over-expression of CTGF is not [31, 40]. Lesional SSc fibroblasts overexpress the TGFβ ancillary receptor endoglin in a fashion correlating with disease severity . Endoglin, when overexpressed in fibroblasts, suppresses the ability of TGFβ to induce Smad activation . These results suggest lesional SSc fibroblasts overexpress endoglin to block further Smad-dependent gene induction. In this regard, one report showed decreased levels of the inhibitory Smad7 in scleroderma fibroblasts , albeit in unaffected skin. Other studies showed no difference, or even an increase in Smad7 levels in SSc fibroblasts [40, 45, 49]. In one study, Smad7 was constitutively present on the TGFβ receptors . The result of this defect is likely to be a bias away from Smad-dependent signaling in lesional scleroderma fibroblasts. Indeed, SSc fibroblasts are relatively non-responsive to exogenously added TGFβ ligand . Collectively, the above observations reveal the complex role that TGFβ plays in mediating fibrogenesis, and seems to suggest that targeting generic TGFβ pathways (TGFβ ligand, receptors, Smads, p300) is likely to be problematic, not only due to the pleiotropic nature of these molecules, but also due to the complex possibly stage-specific ways that cells have of suppressing these responses. Thus, given the pleiotropic nature of TGFβ, it is preferable to target gene- or function-specific, as opposed to general, pathways mediating TGFβ signaling. Therefore, much recent interest has focused on identifying mediators of TGFβ signaling affecting fibrosis-specific, or fibrosis-selective, endpoints. It is likely, then, that targeting the ability of TGFβ to induce specific pathways or genes will be of benefit in generating selective therapies in SSc. In fibroblasts, TGFβ transiently activates the ras/MEK/ERK cascade, which is required for the induction of CTGF expression [16–18]. Intriguingly, in both mesangial cells and fibroblasts, TGFβ induction of a generic Smad3-responsive promoter occurs in the presence of either dominant negative ras or the mitogen activated protein kinase inhibitor U0126, indicating that the absolute requirement for the ras/MEK/ERK cascade in the induction of TGFβ-responsive genes seems to be restricted in a promoter-specific fashion [16–18]. The stable prostacyclin analog Iloprost, which alleviates symptoms of fibrosis in vivo and reduces CTGF expression and TGFβ-induced collagen deposition, acts at least in part by antagonizing the ras/MEK/ERK cascade via the elevation of cAMP . Consistent with this notion, reduction in ERK reduces the overexpression of type I collagen, and the enhanced adhesive and contractile ability of SSc fibroblasts . The ability of TGFβ to induce ERK is prevented in fibroblasts genetically deficient for the proteoglycan syndecan 4, and small interfering RNA recognizing syndecan 4 reduces the elevated ERK activation seen in SSc fibroblasts . Syndecan 4 knockout mice appear phenotypically normal, but show reduced tissue repair responses, indicating that syndecan 4 is selectively required for the tissue repair program . Thus, although broadly targeting MEK/ERK inhibition would be expected to have severe side-effects due to the involvement of this signaling pathway in many processes, targeting syndecan 4 is likely to be of benefit in selectively targeting fibrogenic responses (Figure 2). Syndecan 4 is a receptor for fibronectin, and is a focal adhesion component and is required for focal adhesion kinase (FAK) phosphorylation . Recent data have suggested that FAK and the extra domain A (EDA) form of fibronectin mediate the ability of TGFβ to induce α-smooth muscle actin (α-SMA) [53, 54]. Anti-EDA antibody or recombinant EDA protein suppresses α-SMA induction, but not that of other TGFβ-responsive genes . Consistent with this notion, elevated FAK phosphorylation is observed in SSc fibroblasts . Over-expression of a kinase-defective FAK mutant reduced α-SMA expression in SSc fibroblasts . These results emphasize the notion that although the generic TGFβ signaling pathways may not be suitable targets for selective drug intervention in SSc, examining how individual target genes are selectively induced is likely to provide clues as to how to interfere with appropriate pathways with drugs. Indeed, targeting adhesive signaling might be of benefit in combating SSc (Figure 2). As mentioned above, in addition to signaling pathways directly induced by TGFβ ligand, there is substantial evidence for synergy between TGFβ and other extracellular ligands in driving fibrogenic responses. These other ligands include CTGF and endothelin (ET)-1. CTGF, a member of the CCN family of proteins [56, 57], is induced by TGFβ in normal fibroblasts, but not in keratinocytes, through Smads, Ets-1, protein kinase C and ras/MEK/ERK [16–18, 40, 58]. CTGF is constitutively expressed by mesenchymal cells in development, and by kidney mesangial cells and endothelial cells and is characteristically over-expressed in fibrotic disease, including SSc, in a fashion correlating with severity of fibrosis [59, 60]. CTGF and TGFβ act together to promote sustained fibrosis in rodents . Consistent with this notion, CTGF-deficient embryonic fibroblasts can respond to TGFβ through the Smad pathway, but show impaired induction of adhesive signaling, as visualized by the induction of FAK and Akt and the induction of α-SMA and type I collagen . These results are consistent with the notion that CTGF executes its functions through integrins [62–64], and with a previous hypothesis that CTGF is a mediator of pro-fibrotic responses to TGFβ . However, what is surprising is that the lack of responses observed in CTGF-deficient embryonic fibroblasts were due to the absence of basal CTGF expression . CTGF was required for TGFβ to induce cell adhesion to fibronectin and type I collagen . These results suggest that CTGF acts as a cofactor of TGFβ to induce adhesive signaling in cells that are already activated and undergoing tissue remodeling (e.g., embryonic and fibrotic fibroblasts), and also that targeting basal CTGF expression, which is independent of the TGFβ response element and is not blocked by inhibition of the TGFβ type I receptor [33, 38], might be of benefit in SSc [66, 67]. ET-1 is normally produced by endothelial cells, but is over-expressed by SSc fibroblasts . When added to fibroblasts, ET-1 independently induces a program of ECM synthesis and contraction [68, 69], and can act synergistically with TGFβ [70, 71]. Blockade of the endothelin receptors with a dual endothelin receptor A and B (ETA/B) antagonist significantly reduces α-SMA overexpression and ECM contraction by SSc fibroblasts . As addition of a TGFβ receptor inhibitor to SSc fibroblasts does not affect α-SMA expression but does impact ECM contraction [34, 35], these results suggest that ET-1 acts additively and cooperatively with TGFβ. Significantly, and in contrast to TGFβ receptor antagonism [34, 35], ETA/B receptor blockade does not block basal fibroblast activity . ET-1 induces expression of target genes through Akt and ras/MEK/ERK [68, 69]. The ET-1 response element in the CTGF promoter is distinct from the TGFβ response element [16, 17], and the ET-1 response element, but not the TGFβ response element, is required for the over-expression of CTGF in SSc . Collectively, these data support the notion that TGFβ and ET-1 act together to promote fibrogenesis in SSc through differing yet complementary pathways (Figure 1). The ETA/B receptor antagonist bosentan is currently used clinically to treat pulmonary hypertension and the formation of new digital ulcers in SSc patients [72, 73]. Thus ETA/B receptor antagonism is well tolerated in patients, and is likely, therefore, to be of clinical benefit in alleviating at least one aspect of fibrosis in SSc, namely that of the persistently activated fibroblast. A one-year, unpublished clinical trial in which the efficacy of bosentan at alleviating pulmonary fibrosis in SSc patients was tested was recently concluded, and was negative. However, a non-fibrotic endpoint (a walk-test) was used to evaluate the efficacy of bosentan on overall lung function. Moreover, the length of the clinical trial may have been too short to properly evaluate whether bosentan has an anti-fibrotic effect. For final conclusions to be drawn the published results are needed. Thus it remains unclear whether bosentan may be effective in suppressing fibrosis in patients. TGFβ induces matrix synthesis in fibroblasts and fibrotic responses in vivo and in vitro. The majority of the studies conducted thus far has measured acute responses to TGFβ, but suggest that TGFβ alone is insufficient for fibrogenesis. Furthermore, genetic and pharmacological studies have suggested that broad targeting of general TGFβ signaling pathways, although perhaps of benefit in suppressing aspects of the SSc phenotype, might be problematic for treating SSc due to the pleiotropic nature of TGFβ. 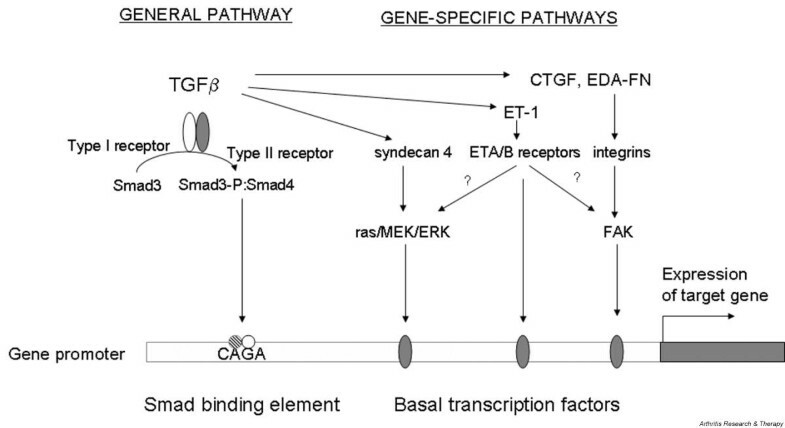 The past several years have led to an appreciation that additional pathways and receptors to the generic, universal TGFα/TGFβ type I and type II receptor/Smad axis are involved with fibrogenic responses to TGFβ, including syndecan 4, EDA fibronectin, ras/MEK/ERK, FAK, CTGF and ET-1 (Figure 2). By manipulating these ancillary pathways, selective anti-fibrotic effects might be achieved, for example, by identifying inhibitors that block induction of fibrotic genes but leave other pathways intact. AL is supported by the Canadian Institute of Health Research and the Canadian Foundation for Innovation and is an Arthritis Society (Scleroderma Society of Ontario) New Investigator.